Lot 1841 a Zoffany filly sold to BBA Ireland for 60,000 guineas ($82,312) at the Tattersalls October Yearling Sale. Book 3 of the Tattersalls October Yearling Sale closed with turnover second only to last year's record levels and an improved clearance rate of above 80 percent, something that has been a feature of all three books of the October Yearling Sale to date. Three lots realized 50,000 guineas (US $68,593) or more on the final day, taking the total number across Book 3 to 27, up from twenty at this sale last year. 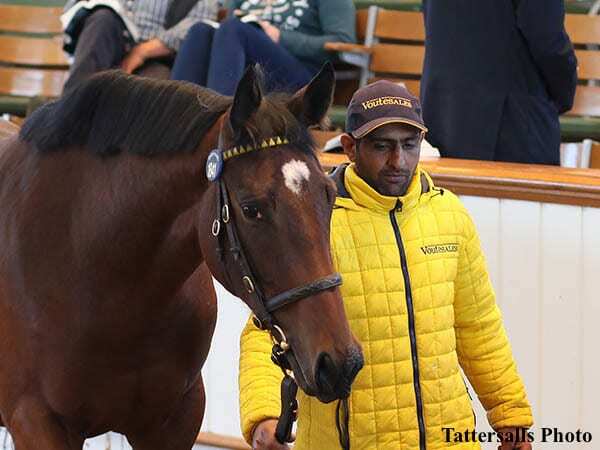 The top price on the second day of Book 3 of the Tattersalls October Yearling Sale was 60,000 guineas ($82,312) for a Zoffany filly out of the listed Height Of Fashion Stakes winner Cosmodrome. The Voute Sales consigned filly was purchased by BBA Ireland's Richard Fitzsimons and is out of a sister to the listed winner Splashdown, dam of the Group 3 Solario Stakes winner Aktamantay. “She might go breezing,” said Fitzsimons. “She's a big strong filly and there's a lot going on in the family – there are Dubawis and Kingmans coming through under the second dam, so she'll always have some residual value. Book 4 of the Tattersalls October Yearling Sale starts Saturday, Oct. 20 with 123 lots catalogued. This entry was posted in Bloodstock and tagged BBA Ireland, Cosmodrome, Richard Fitzsimmons, Tattersalls, tattersalls october yearling sale, The Voute Sales, zoffany by Edited Press Release. Bookmark the permalink.